The search is over! Our lid covers are specifically designed for elongated lids. Unique drawstring design allows our elongated lid covers to conform to the shape of your lid. Individually tufted and made of long wearing, durable polyacrylic yarn. Machine wash and dry. See elongated lid care details below. Our elongated lid covers are densely woven and the pile height is 20mm or .79in tall. The construction is substantial and high quality. 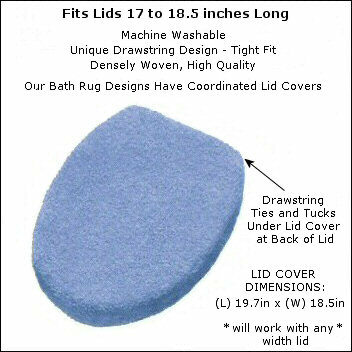 Our lid cover dimensions are 19.7in long and 18.5in wide. Our elongated lid covers will fit lids that are physically at least 17in long and no longer than 18.5in. Any lid width will work with our cover. Any extra material will draw under your lid. The length is the most critical measurement. All our lids covers coordinate with our bath rug collection. To view rug designs select a COLOR on the left hand side of this page. Once you select a specific rug design in the COLOR you like you will be taken to the product page and you will have the option of a lid cover for most every design. We have a large selection of lid cover colors to choose from. If you do not see a color that will work for you please feel free to contact us via phone or email.